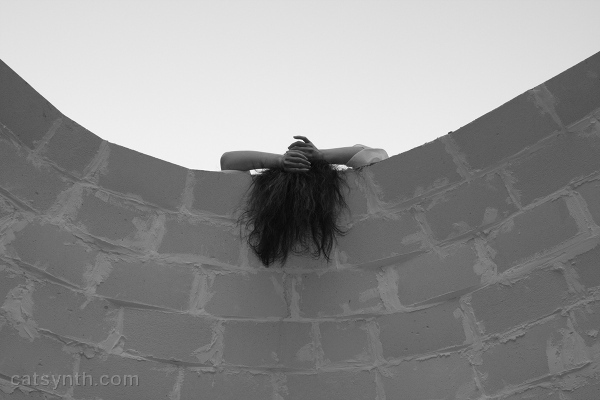 Posted on October 5, 2010 by catsynth	This entry was posted in Art, Music, Photography, San Francisco, Wordless Wednesday and tagged bowls project, butoh, dance, dohee lee, grayscale, monochrome, Photography, San Francisco, Wordless Wednesday. Bookmark the permalink. This is a photo from The Line Between in the Bowls Project, which I reviewed earlier this week. (Follow this link to read the full review.) This image stood out on its own – it features Dohee Lee’s hair cascading into the opening in the top of the dome. Very nice photo! wordless indeed but expressive! I quite like this – simple but very dramatic. Interesting. Wonder how the photographer got down there? Interesting perspective — I like it. The hands seem so sad! Really interesting shot! I love it! Interesting shot. There’s always something interesting going on out there on the Bay! Love it! What is your bowls project? @Katz (And Other) Tales: the photo was taken by me at ground level, looking up at the top of the dome. Funny how many people just comment and don’t read the comments or the links you’ve provided. Aside from that note, this is so well-composed, I just can’t say enough good about it! Perfect! Nice! Glad you caught that. Really cool capture. It’s very dramatic! The Bowls Project looks quite interesting. Great shot I love it!